In a previous post, I tracked the shift in Parables studies away from the allegorical methods of the medieval church to the “one point per parable” method of Adolf Jülicher. In the next several posts I want to talk about a few other scholars who developed Jülicher’s ideas in the twentieth century (Dodd and Jeremias) and a short note on the rise of literary studies of parables beginning in the 1960’s, using Robert Funk and John Dominic Crossan as examples. In the last few installments of this series I want to cover several studies on the parables published since 1990 which treat the parables as coming from the teaching of historical Jesus, yet also allow for some insight on a literary level, such as Craig Blomberg, Kenneth Bailey and now Klyne Snodgrass. Snodgrass provides about sixty pages introducing the usual topics expected in an introduction to the parables. As he states in the introduction, he is not offering a new method for interpreting the parables (31). What sets Snodgrass apart is his assumption that the parables are the authentic voice of Jesus and he rarely discusses matters of authenticity. He is also skeptical of attempts to reconstruct earlier, simpler versions of the parables because this assumes that there was an original form which differs from the form as it appears in the gospels. In addition, reconstructions also assume that anything allegorical was added to that original form by the later church, created to deal with internal problems in the Gospel writer’s church situation. Frequently the context of the sermon is dismissed a priori as a creation of the evangelist, as are the concluding lines which interpret the parable. These assumptions, Snodgrass argues, do withstand criticism. There are no fixed laws of transmission as was once assumed, and the now standard rejection of allegory by modern interpreters simply does not take into context the of Second Temple Period literature (where allegorical elements were often included in parables). Snodgrass therefore studies “each parable in its own right with regard to form and content” (35). His goal is to set aside tedious arguments about sources and original forms and read the parable as we have it on the page as accurately as possible. In order to do this, he provides a 22 page introduction to what a parable was in Second Temple Period Judaism and in the Greco-Roman world. Jesus’ parables stand more in the tradition of the rabbinic parables, but there are clear differences as well. In the body of the book, Snodgrass arranges the parables are into topics (parables about prayer, about Israel, about the kingdom, etc. ) For each parable he provides a section entitled “Issues Requiring Attention.” This is a list of exegetical and theological issues that any interpreter must treat when reading this particular parable. For a pastor preparing a sermon, this section clarifies the main ideas which are important; for the student, here is an outline of issues for a paper! Following this section he lists all of the potential “source material.” This includes Second Temple Period literature, rabbinic parallels and Greco-Roman sources. This is a goldmine of material, often the important lines are reproduced, sometimes they are simply summarized. Following this background material are “Textual Features Worthy of Attention” (key words to study, interesting syntax, etc) and “Cultural Features” (elements of background to study). Once again, this provides the interpreter with a number of tips on what is important in the parable (and perhaps by their commission, what is not so important). The main section for each parable is the “Explanation of the Parable.” This takes the form of a number of questions and answers working through the main points of the parable. In this section he interacts with the Greek New Testament (in transliteration) as well as with key modern interpreters of the text. While he does draw on the literature of the Second Temple Period, he ignores (for the most part) church interpretation. His focus is purely canonical, not historical. He provides a bibliography for each parable, including both better commentary sections and journal articles. Occasionally German and French resources are included, but the emphasis is purely on English scholarship. In the final section, Snodgrass offers some hints on how to “Adapt the Parable” for use in a sermon or Bible study. Here one hears Snodgrass’s pastoral heart – this material on the parables is not to be purely academic without any application! 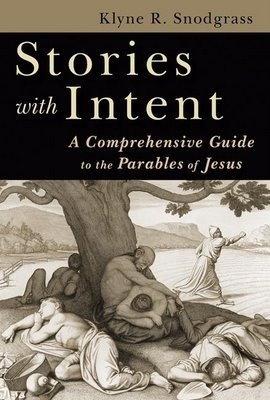 Stories with Intent has become my “first off the shelf” for parables, although some readers may be lost in all of the details. I cannot imagine trying to teach or preach the parables of Jesus without consulting this book. The most helpful element in the book is Snodgrass’s questions, leading the reader in the right direction, without answering all the exegetical questions possible. Again, that might frustrate some readers who do not have the time or inclination to dig into these things themselves. With respect to method, I find Snodgrass’s rejection of form-critical assumptions helpful. While Dodd and Jeremias remain bright lights, Snodgrass calls into question whether they really illuminate the text as we have it. In addition, while Snodgrass occasionally cites some of the literary studies (Funk, Crossan, Via), he does nothing that looks at all like the postmodern studies popular in the late 1960s. Is his skepticism of the assumptions of earlier studies valid? Does his method actually “work” for reading the parables accurately? Bibliography: Klyne Snodgrass, Stories with Intent. Grand Rapids, Mich.: Eerdmans, 2008. No I am pretty sure neither wrote commentaries on the parables. Snodgrass is about as far from structuralism as one can be. And happily so. “What sets Snodgrass apart is his assumption that the parables are the authentic voice of Jesus and he rarely discusses matters of authenticity”. After going through some of the earlier posts, this sentence caught my attention. By rejecting some of the earlier skepticism, Snodgrass’ scholarship does more to respect the authority of the Scripture (by assuming original form) and focus instead on the intent of the parable. His method of categorizing parables topically also seems to fit well with how Jesus taught and offers an applicable method for teaching and study. As pointed out in the post, Snodgrass’ research is more than just academic. In my opinion, his method of study is more beneficial to actually understanding the parable because it does not seek alter or read into the text in any way. Looking forward to using this for the parable paper. I agree with what you said Scott. Snodgrass’ “method of study is more beneficial to actually understanding the parable because it does not seek [to] alter or read into the text in any way.” This is a great observation. The other methods seemed to get lost in the quest for authenticity and finding what may or may not have been added during the transmission process. As was stated in the main post, Snodgrass assumes “…that the parables are the authentic voice of Jesus and he rarely discusses matters of authenticity.” This assumption allows for clearer reading of the parables. I really appreciate Snodgrass’ “Adapt the Parable” section. This goes beyond the purely academic study into the application. The fact that Snograss goes does not get bogged down by skepticism and goes into application as well as academic interpretation gives honor to the whole reason for the Parables. If we get to stuck in the historical and form criticism of the Parables, we miss the whole point. His skepticism of the earlier studies is valid in that he bring the focus back to the Parable itself and not the surrounding form details. His method works for reading the parables accurately because his assumption of the authentic voice of Jesus gives authenticity to the parables and allows for them to be viewed with clarity. I believe that Snodgrass introduces an excellent method of studying the parables, and his book serves as an excellent resource to dig deeper and discover the not only the context of the parable within the time period but also the theological issues or questions to work through in the interpretation process of the parable. After choosing a parable for my upcoming paper, this book was the first one I picked up for my research. I highly respect that within his introduction, Snodgrass takes the time to explain parables in the context of Second Temple Period Judaism as well as the Greco-Roman world. In this way, Snodgrass reveals the importance of understanding the parable within the time period. Similarly, in Mark Strauss’ Four Portraits, One Jesus, his first principle in interpreting the parables is to interpret them in the context of Jesus’ ministry. Some parables had cultural implications that are not present within our culture today; thus, knowledge of the culture at the time gives the parable a whole new significance and meaning. The context of the parable as well as the time period and group of people to whom it was written are all crucial elements if we as individuals are seeking to understand Jesus’ intent in using these parables as a central part of his ministry. In his section “issues that require attention”, Snodgrass understands and recognizes the theological questions that inevitably arise within parables and also attempts to work through these issues. By addressing these, he gives the reader something to chew on and also provides a wonderful example of not only attempting to interpret the parable when reading it but also to look for problems and attempt to work through them rather than to avoid them or put them on the back burner. I appreciate that Snodgrass does not hold to all parables having only one main point, while he does introduce some that he believes to have only one central point, but also recognizes some parables having two or three points and others containing allegorical elements. Not only does he attempt to give the reader an understanding of the parable within the context in which it was written, but he also devotes a section to adapting the parable in a way that is applicable to readers today. In this way, he acknowledges and appreciates the historical and cultural implications and significance of the time, but also leaves room for there to be universal truths that are applicable to all generations including us. I believe this method to be very workable for accurately studying the parables, although I definitely would not object to utilizing other resources. I am definitely a fan of using many resources and studying multiple methods rather than sticking to just one. However, I see no error within Snodgrass’ method and would definitely recommend this book for others attempting to study and understand the parables of Jesus. In this post I found it interesting how Snodgrass talked about parables and how he looks at the interpretation of them. In his book he talks about how to approach a parable to get an understanding of what was meant by the parable. Snodgrass really talks about how to read a parable and fully understand the content to get the most out of it and fully put the parable into what you are going to use the parables for. Snodgrass really has some good ideas on implementing the full meaning of a parable into a person’s life and I really think it would be helpful reading his book. Snodgrass’ methods sound very beneficial and informative, and although his methods may be directed towards Christian who already believe in the authenticity of the bible, the authenticity of the parables is vital to people who believe in them. However I find that his methods are similar to Kenneth Bailey, in that he compares the parables to the way that the culture was in the first century, I find this crucial to understanding the parables, I agree with Maggie when she states that she liked how Snodgrass did not give all of the Parables the same meaning, but the mean different things; and are in different categories. Another thing that I like about Snodgrass is how he includes methods of teaching and application, without application of the Bible in our lives; it is useless to even read it. Snodgrass shows that he has passion for parables and for the bible. It is also very important to use good sources and broaden your horizons by reading many manuscripts, and not only drawing from one source. Although I have not yet read Snodgrass’ book on parables I look forward to studying it in the future. What Snodgrass said about studying parables i found quite useful. Like Maggie said above and Scott also re quoted, about him not giving all the parables the same meaning but they mean different things. I found that very interesting and something i had never thought about it like that before. He explains how to understand a parable in a way that is simple and easy and makes valid points while doing this.I also like how he talks about separating the parables by topic which can be very useful. There is lots of useful information in here it seems that will assist me with writing my parable paper. I agree with Scott that the way Snodgrass applies the parables to us is beneficial. It is interesting to see how Snodgrass interprets Scripture as is without any historical background or any other of his preconceived thoughts. “His goal is to set aside tedious arguments about sources and original forms and read the parable as we have it on the page as accurately as possible (Long).” Parables are stories intended to help us with life so we should try to take them for what they are instead of adding any of our own thoughts or opinions and focus on what Jesus was saying to us. Looking at it in this way, it makes sense that Snodgrass would arrange the parables into topics so that it is easier for us to use and apply to our lives in the best way possible. I think that Snodgrass’ skepticism is valid, yet I don’t know that I would go as far to say that there was no previous form before the gospel occurrences. I see no reason why it would be inappropriate to consider the possibility that some of Jesus parabolic materials were stories, metaphors, or analogous sayings that were used in that time period. I do think; however, that the parables in their form in the gospels are accurate as to what Jesus said and are true to the unique flavor he would have brought and added. If Jesus were using other sources to make his point, he would have had a sense of ‘creative license’ in order to make that material suitable to his main point and teachings. I think that his approach does work. One of the most important ways to interpret and study a parable is to look at it in the context. According to Strauss, there are six important things to consider when attempting to understand the parables; I think this is a great pattern to follow. We should interpret them in the context of Jesus’ ministry, relate them to Jesus’ preaching of the kingdom of God, recognize the cultural and literary backgrounds in the Old Testament and Judaism, seek the primary point, be cautious about the allegorical elements, and to recognize the narrative function of the parable in the Gospel (Strauss, 452). Snodgrass does each of these thing. By arranging the parables into topics, sharing other textual features, having an explanation of the parables, describing literary elements of the Second Temple Period, reading the parables and not questioning the authenticity, and having the application of the parables all work together to for the six part interpretation that Strauss teaches. I do not think that you can really understand any of the parables without looking at it from all of the above dimensions. Also, without looking at it from all dimensions, one may use too much of their own interpretation, which will ultimately lead to misinterpretation, especially without the guidance of the Holy Spirit.